Grass reinforcement turf pavers is a draining, interlocking high density polypropylene interlocking flooring system, which is capable of withstanding 250 tons of pressure. It can be used for paddock areas, gate areas, horse paths, barn aisle ways, indoor wash stalls,outdoor arenas and round pens, as well as ramp or slope soil stabilization. Not only does grass driveway paver from Leiyuan cost less per square meter to install, but it significantly outperforms asphalt, concrete, brick and stone at extreme hot and cold temperatures. While these alternative surfaces erode and crack under extreme conditions,(necessitating costly repairs and quicker replacement) long-lasting gravel driveway system retains its strength and structural integrity, making better use of infrastructure improvement funds. Ground reinforcement grid from Leiyuan Industrial Company Limited is manufactured from 100% recycled plastic materials. It can helps city to reduce the “Heat Island Effect” because it can be filled with natural land cover like grass. 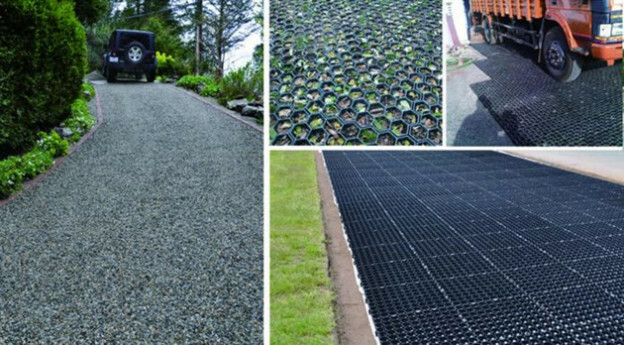 At these higher city temperatures result from non-permeable surfaces like asphalt and concrete, HDPE grass paver can absorb the sun’s energy instead of reflecting. This is important because the higher city temperatures increase air pollution levels, and heat-related illness and fatalities, and put extra pressure on our energy generation network. Leiyuan grass paver’s has a good feature of environmentally-sustainable permeability. This advantage allows surface water to soak through the soil and plants, which do an excellent job of filtering out pollutants, and therefore it not only help maintain ground water quality,but also avoid environmental problems caused by storm water runoff. If you have questions about the uses of our gravel stabilization grids, call us or fill out our contact form today!